You can dedicate a star in honor of someone special. Choose from several custom gift and memorial star packages. Kids Name a Star packages also available. In a hurry? Create a Name a Star Instant Certificate. Now only $19.95! Looking for a unique, personalized gift? Give a star name to someone! Buy the Name a Star Gift Package for that someone special now! When you order one of our packages you are buying the perfect gift for all occasions that will be remembered with each glance at the stars. Not sure which Name a Star Gift Packages to give? Name a Star now offers Gift Certificates for any Name a Star Package. The lucky recipient can name their own star and even upgrade to a Name a Star Package of greater value and just pay the difference. 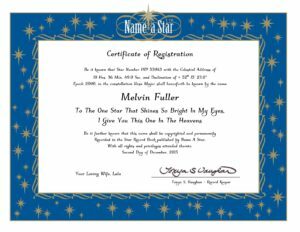 Customize the star certificate with a personal message or tribute! The Name a Star personalized service makes it very easy to buy a star name for a special person, occasion or event. Name a Star, The Original Star Naming Service, has been helping customers purchase and register star names since 1978. At Name a Star we guarantee customer satisfaction and have a reputation for reliable service. For your peace of mind. Name a Star has a money back satisfaction guarantee. The Name a Star Memorial Star Certificate is a touching and loving gift that can be given in memory of a loved one. Show you really care and buy from Name a Star – The Original Star Naming Service – Since 1978®. You can buy a Name a Star gift and present it to friends, relatives or loved ones as a birthday gift, wedding gift, anniversary gift, graduation gift, retirement gift, a romantic gift idea, a Valentine’s Day gift, the perfect Christmas gift or many, many other occasions, achievements or events! You can buy and present a star named for Father’s Day, Mother’s Day or any other special occasion. What could be a more memorable gift than a star named for a loved one, someone special or in honor of a holiday, achievement, special occasion or to show your appreciation. For more information regarding buying a star name, contact Name a Star or refer to the Star Naming FAQs. Thank you to SHO Photography for providing Name a Star with the Milky Way image. The photo was taken in Central Oregon near our office on a dark starry night. SHO Photography is based in Eugene and serves Oregon, California and Washington. SHO Photography provides custom fine art photography. Learn more at www.SHOphoto.com.